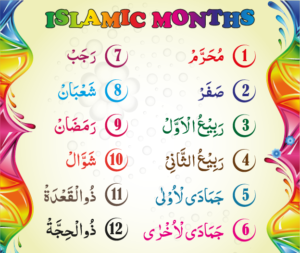 Twelfth and last month of the Islamic Calendar. Meaning: The month of “Hajj” (Pilgrimage). This is the last sacred month in which fighting was forbidden. The fifth pillar of Islam “Hajj” is performed in this sacred month. The first ten days of Zul-Hijjah are the most virtuous days in this whole month, Hajj is performed amongst these ten days. i) Hadhrat Umar (R.A.) met martydom- 27th of Zul-Hijjah in the year 26 A.H.
ii) Hadhrat Uthmaan (R.A) was martyred- 18th Zul-Hijjah in the year 35 A.H.